My favourite new TV-show is The Mentalist. One of my favourite little interests over the last year or so has been to try to figure out why some people stand out, why they are charismatic. Now, if you have seen the Mentalist â€“ a show about a former fake psychic whoâ€™s really good at reading people and helps the police out with solving a weekly murder case â€“ then you have probably seen how charismatic Simon Baker is in the lead role. And even if you havenâ€™t, this article just draws some inspiration that show. Many of these qualities are those one may find in many other people that are often considered charismatic like George Clooney, Bill Clinton or just some friend you might have. Find your own variation by exploring yourself. But also by experimenting and trying things you may not normally do. Big changes do not come from just staying in your comfort zone and telling yourself â€œOh, thatâ€™s just not meâ€. Big changes pretty much always start with feeling awkward at first. Yes, this sounds really obvious. But you have to do it too. If you actually try smiling more youâ€™ll discover how the world treats you changes a lot. People generally react to how you treat them. And emotions are contagious. And, even if you donâ€™t always feel like smiling do it from time to time anyway (not all the time though of course, thatâ€™s just weird). Because it works backwards too. Try forcing yourself to smile for thirty seconds right now. By making yourself smile, no matter how you feel, your body will start to release all those wonderful chemicals that make you feel happy. 2. Be interested, open and curious. Now, you may think; â€œpeople arenâ€™t always that interestingâ€. Sure, that may be the case. But this is also a belief and you tend to see what you want to see. If you make the effort to actually be genuinely interested in people you often find interesting things. This is one of the qualities people often mention after having met charismatic people like Bill Clinton or Oprah. They are fully there. Centred and with the intense focus that being present creates. People arenâ€™t used to that and feel special. So listen fully to the person as an equal no matter who it is. Keep the eye-contact without staring (and donâ€™t forget to break it sometimes). Also, presence tends to make you more open and curious in a natural way. When you are present things and people just tend to become more interesting. Focus on your breathing. One way to quickly become present is to take breaths with your belly â€“ this calms your body too â€“ and just focus on your in- and out breaths for about two minutes. Focus on whatâ€™s right in front of you. Or around you. Or on you. Use your senses. Just look at whatâ€™s right in front of you right now. Listen to the sounds around you. Feel the fabric of your clothes and focus on how they feel. This is a very important point and something I think is perhaps often missed by people who want to improve their social lives. They may think â€œwell, I have been so nice towards everyone for the last few months but it doesnâ€™t seem to have changed their behaviour towards me muchâ€. This is the â€œnice guy/girlâ€ problem. S/he is very nice but there is no assertiveness. There is no changed feeling within about how you feel you deserve to be treated. You may still be nice just to get approval from other people. You feel the craving need. And people who crave approval the most tend to get it the least. Charismatic people are often seen as leaders of some sort. 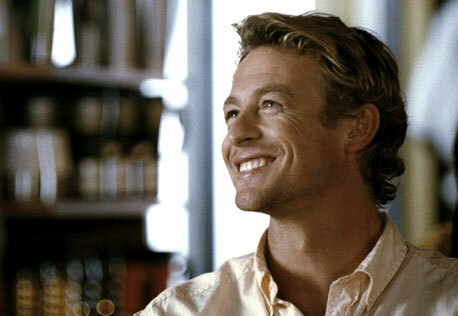 Simon Baker is assertive in a relaxed way on the show. Although he isnâ€™t the boss officially he often gets to do things his way. And although thatâ€™s just a TV-show, I think it works a bit like that in real life too. You have to be a leader in some way, but it doesnâ€™t have to be in an official way. Like smiling, this one is pretty obvious too. You canâ€™t really be that charismatic if you arenâ€™t confident. Iâ€™d say, face your fears. I think that if you want to experience better self confidence on a deeper and more fundamental level you simply have to have experiences where you face your fears. There is no way around it. Also, itâ€™s only when you face your fears that you discover the thing that billions of people throughout history have discovered before you. Failure wonâ€™t kill you. Nor will being wrong. The sky will not fall down. Thatâ€™s just what people that havenâ€™t faced their fear yet think. Be present. If you are present and in the moment when you are taking action to face your fear you donâ€™t get so nervous and stuck in negative thought loops about how everything will go wrong. How do you do it? By not taking everything so seriously. By keeping a light and positive attitude. By having an abundance mentality. Check out more about having a light attitude in this article. 7. Be socially free and authentic. On the show Baker really donâ€™t care too much about what people think of him. He just does what he wants. Of course, in reality you have to be a bit more careful. But when you are overly concerned about what other people may think then you often act in reaction to what you think they might say or do. And so you canâ€™t be your most genuine and best self. Realize people donâ€™t care too much about what you do. They have their hands full with worrying about their own lives and what people may think of them instead. Yes, this might make you feel less important in your own head. But it also sets you free a bit more if youâ€™d like that. Focus on what you can control. Hereâ€™s a great way to look at things from the ancient scripture Baghavad Gita: â€œTo action alone hast thou a right and never at all to its fruits; let not the fruits of action be thy motive; neither let there be in thee any attachment to inactionâ€ To me it means that I cannot control the results of my action. I canâ€™t control how someone reacts to what I say or what I do. And that I should do what I do just because it is something I want to do rather than because of some outcome Iâ€™d like. But at the same time I should not let these two ideas lead me to become passive and get stuck in sitting on my hands and not taking action at all. So I do what I think is right and that is my responsibility. And then the rest (the possible results), well, that is not up for me to decide about or try to control. I let it go. So being more charismatic is mostly about bringing out more of these or other positive qualities in yourself. They are already there to some extent. You just have to practise and have the courage to make them stronger and bring them out more consistently. helpful to improve myself. it gives strong tips easy to aquire. Amazing! I love this article so very much! I always refer to it, when I am in desperate need of personal development!. Thank you so very much for doing an awesome job! That’s all fine and dandy – I really like reading this sort of thing but there’s 2 things you’re forgetting. 1) This is a TV show. How many Patrick Janes have you met in real life. TV has a way of making the lead character look really “out-of-this-world” special. 2) Generally speaking, people who are really ugly are treated very differently to those who are good looking. Many experiments have been done and the results show that if you’re good looking, people will want to talk to you but if you’re really ugly, you can be as charismatic as all hell and people still won’t want anything to do with you. Sorry, that’s life – that’s people and that won’t change.